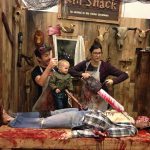 We created The Kill Shack as a unique interactive photo experience, great for horror-themed conventions or events. 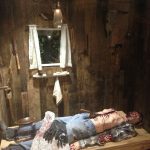 The eye catcher of this ‘creepy cabin in the woods’ set is the blood stained butcher table with the mutilated corpse of a hitch hiker. 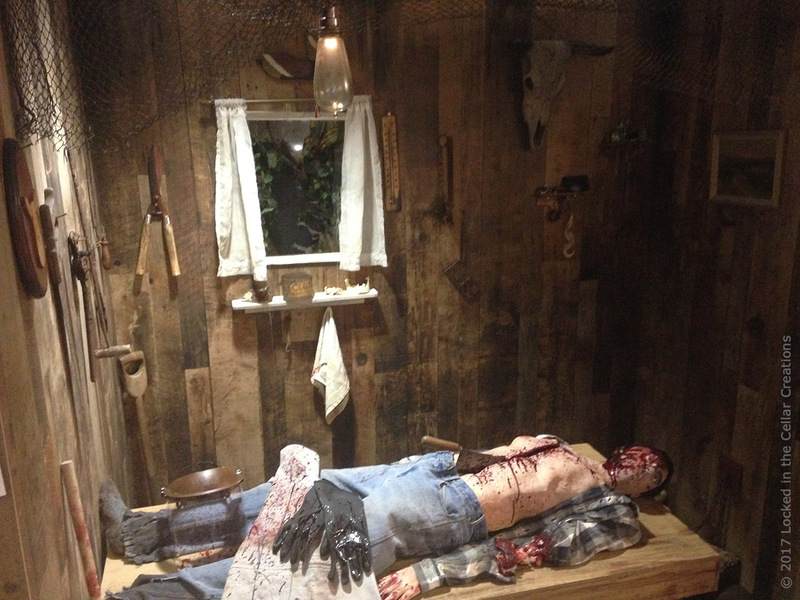 All around the walls you’ll see the killer’s collection of tools and mementos of past victims. 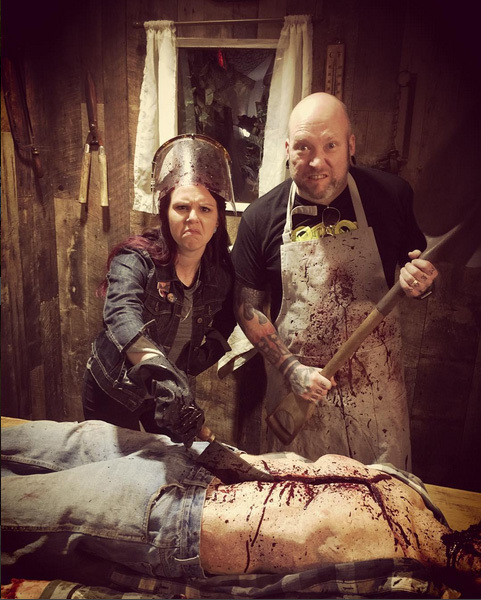 Guests are invited to come in and dress up like a maniac with the blood splattered aprons and splatter shield, after which they can pose like a true psycho killer holding an array of bloody weapons. 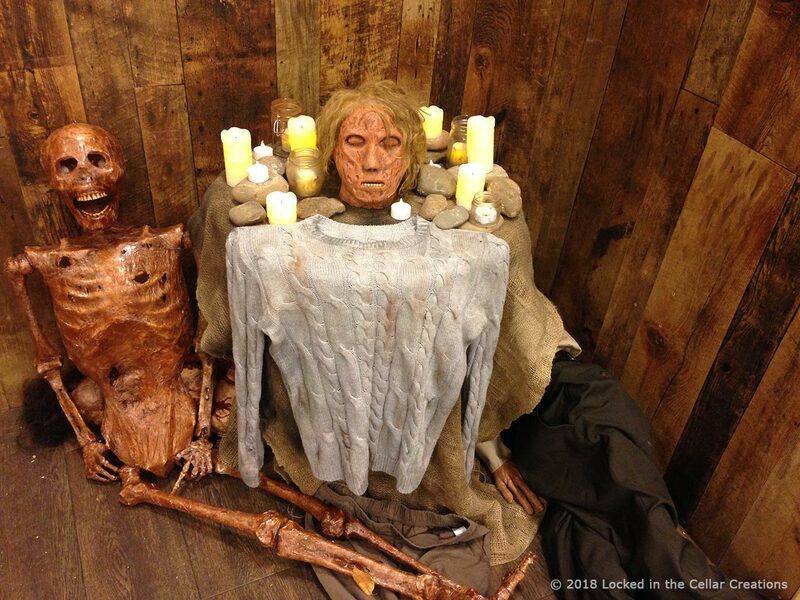 They can even open up the corpse’s chest and pull out his heart for an extra gory effect! 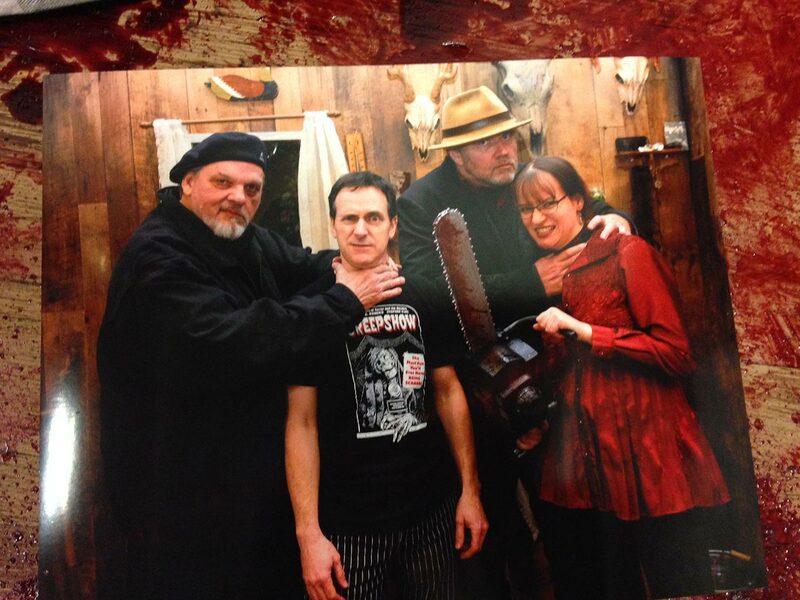 A family that slays together… 2017. 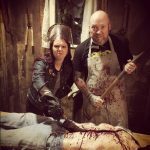 Show me your kill faces! Shock Stock 2017. 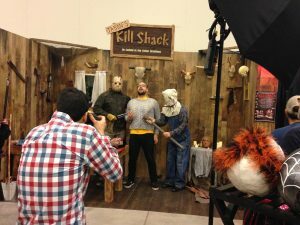 We have hosted celebrity photo ops in the Kill Shack on several occasions, welcoming Leatherface actors Dan Yeager and Bill Johnson, as well as Jason Voorhees actors Steve Dash and C. J. Graham. Jason’s Kill Shack: Upon special request from the organizers of Frightmare in the Falls, we created Jason’s Kill Shack. The left side remains unchanged with the table with the mutilated hitchhiker corpse, and in the right corner we added Pamela Voorhees’s shrine, including dear mommy’s head, clothes, an array of candles, and a pile of corpses underneath. Tea with Granny: Loosely inspired by Hitchcock’s Psycho, we invite you to have tea with dearly departed grandma. Bugs are wreaking havoc in this scene, and can be found all over the tea set and shire. 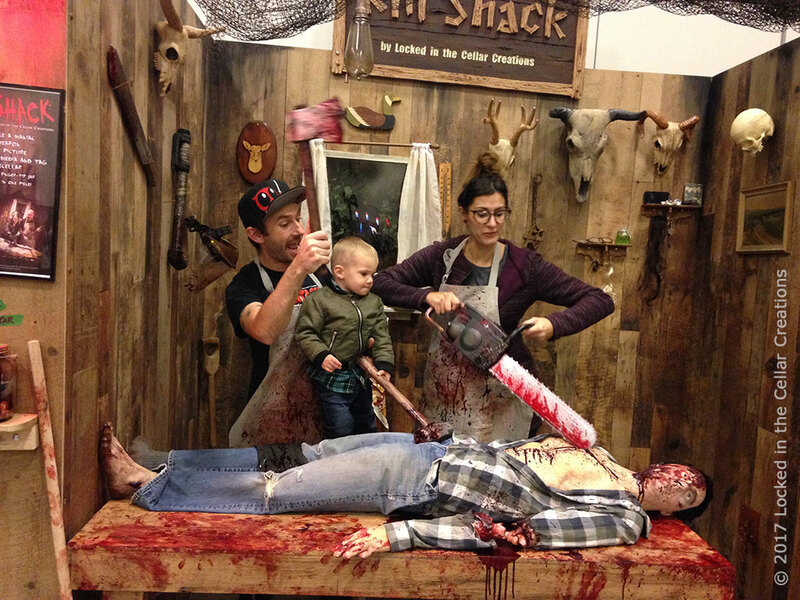 In the corner stands a creepy grandmother clock, showing that it’s almost midnight… This set up is less gory than the regular Kill Shack, but no less macabre! 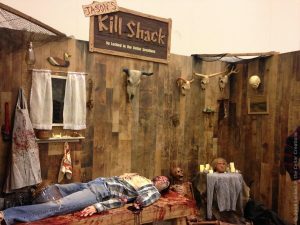 The standard Kill Shack set fits in a standard 10′ x 10′ space (inside width: 8′). The walls are 8′ tall. It comes with vinyl flooring, and with flickering lights if electricity is provided. If desired, we can make the Kill Shack 4′ wider, as you can see in the pictures of “Jason’s Kill Shack”.